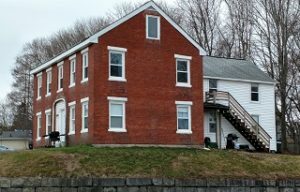 Cryptic House LLC has just closed on another rental property, 40 Middle Street in Orono. This 3,800 sqft brick building was built a few years before the start of World War I. The house sits atop a small hill in downtown Orono, and because of the stone wall surrounding the property we have nicknamed it “The Castle”. With some minor renovations and landscaping work we’re confident that this will be one of the most classic and upscale apartment buildings in the village district.